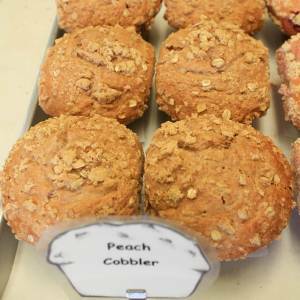 All the way from the Kunlun Shan Mountains, Frank Michaud brought the peaches to cobble together this muffin. He then traveled through Persia where he learned the medicinal properties of the peach. There the peach is called The Persian Apple, so Frank does a little translating when he calls this muffin: Peach Cobbler.